Where should I start this post? Maybe by telling you a bit more about myself. When I graduated from high school, the majority of people I knew either decided to attend university right away or spend some time abroad as an Au-Pair or dive straight into the work environment. None of these options seemed appealing enough to me nor were they the right choice at that time. Instead, I decided to spend a year in Vietnam, working at an international publishing house. It was one of the best things that could have happened to me. Not only did it bring me that much closer to my roots, learning more about my cultural background, language and country, but it also helped me to make the decision to attend university once I would return to Germany. I was what felt like "being ready to study” again. Only thing I had to figure out first: What do you want to study, Mi? I have always been interested in foreign cultures and languages. Learning new languages is my thing, sort of. Coming from a multilingual family (German, English, Vietnamese, Russian, Japanese, Chinese, Polish, French to name a few), I naturally grew up in an environment which appreciates and fosters foreign languages hence one of my first choices was studying something language related. Option 2: Politics. Growing up, I was always intrigued by working in the foreign ministry (ideally becoming an ambassador; not that much to ask, right? ), and along with that being able to combine it with my affinity towards languages. The ability to travel all around the world, and communicating with people of different backgrounds and nationalities, sharing each other’s stories, ideas and experience, was the cherry on top. I applied for both options and got accepted to universities that were offering both majors. Option 3, is the reason why I decided to write this post. Something I have always been drawn to, and that has caught my attention in such a rapid pace even though it was the one option I have never truly pursued but neither was I willing to give up is Architecture, especially Interior Design. I am intrigued by textures, colors, materials and patterns. Secretively, I would start reading more about architecture at home until I quickly came across different names of people and buildings, followed by days of YouTube and Google research. However, I never had the guts to actually apply for art school nor did I feel truly comfortable in a surrounding that would (naturally) attract the architecture/ design affiliated community. I had the impression, some people had the need to say something, anything about architecture and interior design to make a point. It felt suffocating. I felt uncomfortable because I am a person that would naturally turn away from people who are carrying the notion or the idea of being something without looking at the source, without understanding where their interest for a certain topic is arising from. I felt uncomfortable because I myself was carrying the idea of being an interior designer for years and years without actually pursuing it. 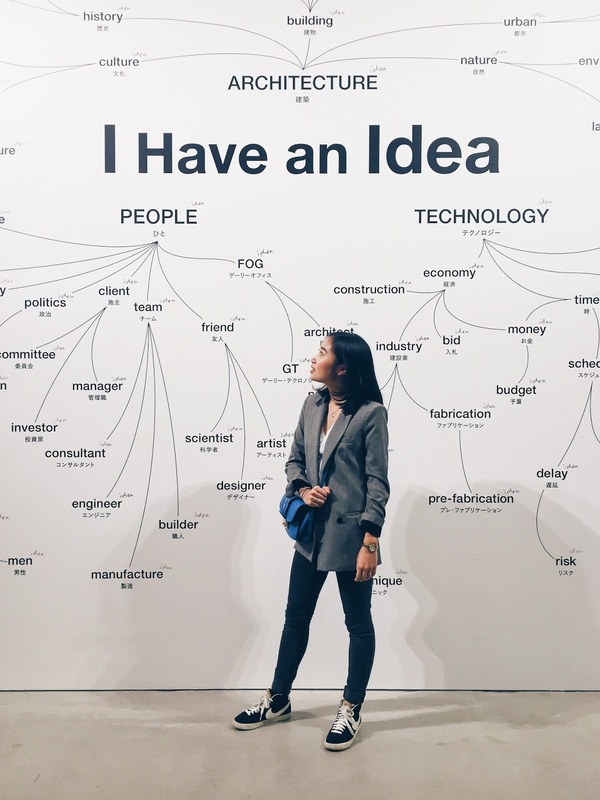 Initially, this post was supposed to show you my experience at Frank Gehry’s “I Have an Idea”- exhibition in Tokyo, where I recently went. I just wanted to share some pictures, and encourage you to visit the exhibition if you are given the chance. Instead, I ended up writing this post. I would like to share with you what I have learned from my experience. Don’t hold onto notions and ideas that we carry about certain things, certain people or emotions. This will eventually create boundaries and limitations, keeping us from pursuing what we truly desire and believe in or what we are good at, actually good at. We get caught in the idea of pretending without being, without living. Nobody can be a better version of you than yourself. Nobody ever ended up happy being someone they are not simply because being you is never wrong. Letting go of notions and ideas of something can be so deliberating because it opens up new perspectives to what seemed to be a never-ending trap, or in most cases, letting go means starting to pursue. Whatever it is, I hope you will be able to let go of what is preventing you from doing and pursuing, and I wish you all most of luck.